Years back you couldn't talk about Kuat NV without attracting haters on the side. Kuat NV didn't measure up. But it didn't take long before the company sneaked in Kuat NV 2.0 to change the narrative. Again, Kuat NV 2.0 attracted lots of fans. In today's post, we want to show you what made bike fans think that Kuat NV 2.0 is the real deal when you are considering a bike rank. We also want to walk you through each feature of Kuat NV 2.0. Most importantly, share with you reasons why it scores best in each area​ and help you understand why it is one of the best hitch bike racks. That's fair because it is the only way you are going to know if Kuat NV 2.0 is worthy of your dollars. Removal and Storage: Does it Still take the lead? It is the first thing that rings in people’s mind when considering buying a bike rake like Kuat. Kuat NV 2.0 takes the lead in performance. It has the best in class security features, excellent finish, and integrated work stand. In other words, it is a high-quality bike rack that competes head to head with the Thule T2 Pro if when you look at performance. Do you know the best part? It has an integrated work stand. Hands down, no other bike rack on the market has this feature. We have the best news for you. The Kuat NV 2.0 takes an early lead in this area thanks to the test we did. Its ratcheting arms is easy to snug and release, while its rear wheel straps are easy to manipulate. But here's what we love most. Its main most pivot is well thought in terms of design. If you have bought the early version of Kuat NV, you will notice that there’s a lot of improvement in this area to enhance its design and ease of use. The new design has a large lever, which means you will be lowering and raising the rack with ease. Thanks to its release lever, you can press the rack with your foot in an upright position without bending down. Unloading the rack is still a two-hand operation. The only caveat here is the weight, which will depend on the number of bikes have on the rack. All this is possible because of the titled down position feature the bike has. Based on the ease of use alone, the NV 2.0 is no match for Thule T2 Pro which uses a release handle to lower and raise the rack. We know most Thule T2 Pro fans will deny this, but unless you have tried Kuat NV 2.0, you might never know the difference. The NV 2.0 still uses the same vehicle attachment like its Kuat NV older version. It has a knob at the end of lower support. Its role is to expand the carrying system within the hitch receiver without wobbling. Thule T2 Pro uses a similar system, but the only difference is Kuat NV 2.0 still needs a locking hitch pin. Hey, don't get discouraged because, both systems still gets the job done. It is just that, Kuat NV 2.0 doesn't score high here. It is a big consideration that tops in people minds. It then begs the question? How does Kuat NV 2.0 excel in this area? It comes with two bulky cables locks. You will see one lock extending from the black end of each tray to secure each bike. The other cable loops through the frame of the bike. Both of these cables allow you to secure all your bikes. That said, the NV 2.0 still gets our thumb of approval when it comes to security. Thanks to its superior cable locks that offer excellent protection, you can't compare them with other bike racks. There's one thing that's remaining though? 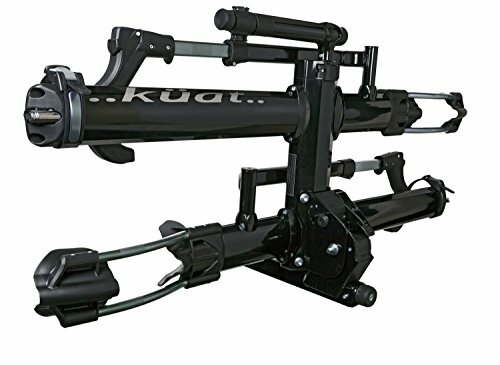 For you to get the Kuat NV 2.0 bike rack. From the excellent features to the performance of the bike rack. We are confident it is something that you need to carry your bikes and keep them secure. Few bikes like the Thule T2 Pro will measure up with Kuat NV 2.0 bike rack. If by any chances, you didn't like that early version, we doubt if you will still hold the same view. We have to say that the bike rack has gone through major changes for it to receive great love from us.